I live in a house with two little boys and one big one, which also means that I live in a house with lots of smells. Also, some of those smells are quite unpleasant. Since we stay away from synthetic fragrance in our soaps, laundry detergents, and cleaning products, it can be hard to really get rid of strong odors. I love diffusing essential oils, but sometimes I need to tackle odors on fabrics, in bathrooms, or in closets. For this reason, I've been really into making sprays using essential oils and alcohol. Furthermore, this is an easy way to make custom linen or room spray. One of my favorites is this Season's Greetings linen spray that smells just like Christmas! Normally I refer to this handy article from the Tisserand Institute when blending essential oils with alcohol. Because it details how to effectively (and safely) use alcohol in aromatic blending. However, lately, I've been needing a pine scented DIY air freshener spray that is strong enough for those stinky boy odors! I love combinations of rose, lavender, and citrus, but my boys aren't huge floral fans. That being said, I decided to make something more manly. What could be more manly than a cabin in the woods? To achieve this scent, I sat down and thought of the essential oils that reminded me of a cabin in the woods. Evergreen, earth, and wood all came to mind. One of my favorite masculine essential oils is Cedarwood. There's a reason we use cedar chips in animal pens and horse stalls! It is a fantastic deodorizer. Cedarwood gives a lovely earthy aroma as well. I use it often in calming and grounding essential oil blends. Another exceptional deodorizing oil for this DIY air freshener is fir needle, also known as Siberian Fir. I love the coniferous aroma that reminds me of freshly cut fir trees. It is slightly earthy and very refreshing. Black spruce is quickly becoming one of my favorite evergreen oils. It is slightly deeper smelling than Siberian fir but crisp and bright. Black spruce definitely has its own unique aroma that blends perfectly with other evergreens. Finally, to add some extra earthy and grounding notes to this blend, I added vetiver. This oil can be a little off-putting on its own, but it is a great fixative for perfume or linen blends. That means it helps the aroma linger a little longer. Together, these oils combine to make a refreshing DIY air freshener blend that gets rid of odors and keeps them away! Measure 4 ounces of Everclear (151 proof or higher) into a clean mason jar. Drop in essential oils and stir well to combine. Using a funnel, pour perfume mixture into an 8-ounce spray bottle. Fill the rest of the way with distilled water, leaving room for the sprayer. Secure spray bottle top and shake to combine. Spray on linens or in the air as an air freshener. Because this DIY air freshener recipe contains alcohol, it can be damaging to wood surfaces or some countertop surfaces. Keep out of the reach of children and be careful not to spray near eyes, mouth, or nose. If you would like a brighter smelling blend, you can always swap vetiver with lemon or another citrus oil. Also, any of the conifer oils (Siberian fir, black spruce) can be replaced with whatever conifer you have on hand (Balsam fir, cypress, white fir, pine, etc.). They will have a slightly different aroma, but still that iconic evergreen scent. Note: you may also be interested in our homemade air freshener for the bathroom. Have you ever tried making a DIY air freshener? It's simple, and great because you can make up your favorite blends. 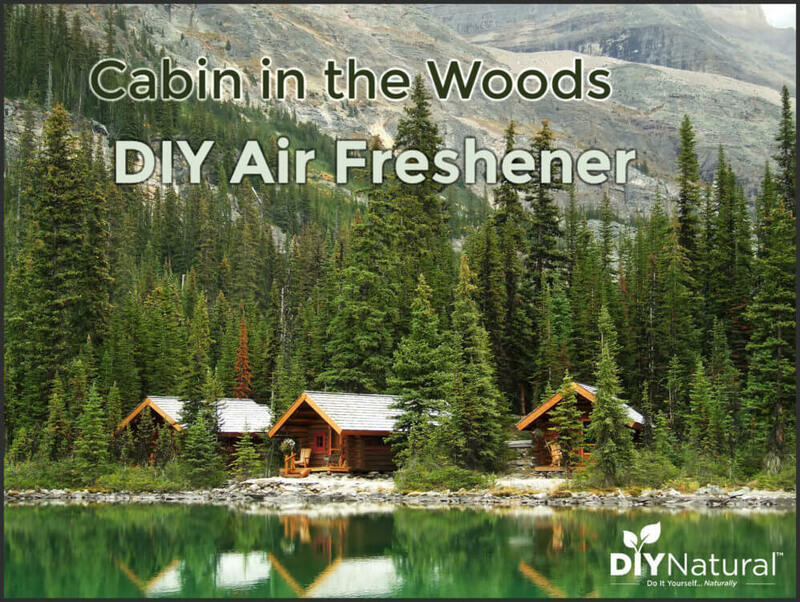 That Was Cabin In The Woods DIY Air Freshener Spray Recipe, Hopefully it's useful and you like it.